Sam is so excited about Christmas! He's thinking about what to put on his Christmas list, anticipating holiday parties and puzzling over one very mysterious gift – a sparkly box sitting on the mantel above the fireplace. Written by Jill Hardie and brought to life by the rich illustrations of Christine Kornacki, The Sparkle Box is a heartfelt Christmas story that celebrates the beauty and excitement of the Christmas season, while gently bringing the true meaning of Christmas into focus through a story that features a powerful Christmas tradition. Children and adults of all ages will be captivated by The Sparkle Box and forever changed when they discover the Sparkle Box is a gift that honors Jesus on his birthday. Readers moved to adopt this faith-centered Christmas tradition in their homes can put a Sparkle Box, included with the book, under their own Christmas tree. or for $14.76 on Amazon by clicking here. 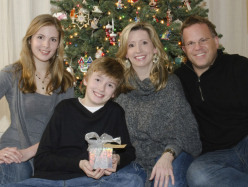 Author Jill Hardie, her husband, and their two children began the tradition of placing a Sparkle Box for Jesus under their Christmas tree approximately seven years ago. The first time they opened His gift, the commercialism of the season melted away and they experienced profound peace and happiness. It's Jill's hope that The Sparkle Box book will ignite a new Christmas tradition that helps center Christmas in the true joy of the season. As parents to my children my husband and I have tried to balance out giving to others within our family. Sometimes we've found it harder to help or give than other times. When Makenzie was 9 she decided to start a blog and ministry called Punky Monkey Missions. She felt the Lord was leading her to help others in any way possible, she started by sewing tiny clothes for the popular WebKinz. Next, she learned to crochet so she set out to help keep the homeless in our community warm with a handmade scarf and hat. After a while she wanted to include helping others by donating to their adoptions or blessing them with money for their mission work. If we would have had this book back then our Sparkle box would have been stuffed full of papers telling all of the ways Kenzie has helped others. Kylan even got on board and wanted to help! I'm so proud of my kids for giving freely of their time, money and energy to help others. That's exactly what The Sparkle Box is all about! As you read through the story you learn that a Sparkle box is included for your own family and as you continue reading you learn how you can help others and fill your box up and that is your gift to Jesus. This is a story that is sure to be loved by everyone and might just become a holiday tradition in your family.